C.S. Lewis’ The Screwtape Letters – which consists of epistolary advice from the senior demon Screwtape to a junior demon Wormwood on the damnation of a human soul – is frequently described as a satire. But I don’t see any satire at all in The Screwtape Letters. What I do see is a brilliant and generous exploration of human nature, a miniature portrait of Britain as the Phoney War comes to an end, and some of the most perfect prose you are going to find in English. Satire uses exaggeration and intensification to criticize a person, idea, institution, or social convention that has power by making it look ridiculous. Satirizing demons is difficult because if you don’t believe in them as metaphysical beings (ie, you don’t believe they exist), then there is nothing to criticize. If you do believe in devils, then you are likely to regard Lewis’ Screwtape as utterly convincing rather than ridiculous. Metaphysical evil is self-exaggerating and self-intensifying after all. And Screwtape’s bureaucracy and banality, twenty years before Arendt’s Eichmann in Jerusalem, offers readers who reached the age reason before the close of the twentieth century, a highly plausible picture of hell. 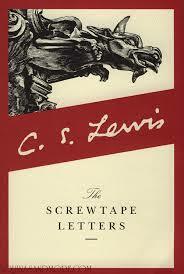 But The Screwtape Letters offers much more than an original demonic voice, satirized or not. Its greatest achievement – and I think, real purpose – is its comprehensive depiction of the human character in all aspects. Screwtape is, of course, interested in exploiting human vice, vanity, and pettiness to achieve his goals, so these get full treatment. But he is also interested in neutralizing human virtues because these are weapons that counter the work of demons. The emphasis is on religion and the work of religious devotion throughout, but Lewis’ insights are so universal they are likely to please readers of any religion or no religion at all – except for those diehards who are dissatisfied with any book that does not exactly confirm their particular convictions; and for such folks I recommend reading very few books or none at all. At best, you’ll be wasting ninety-five percent of your time. Why bother? Screwtape considers the sources of domestic harmony and disharmony; sexuality, love, and married life; the foibles of social interactions in all its forms; the hybrid animal and spiritual nature of humans (under the theory of “undulation”); the character of Christianity and other trends of thought; the temptations of the world; and more. Perhaps my favorite letter is on the nature of human laughter and joy because many good things in life, many pleasures, are gifts Lewis believes God wants us to embrace. In a few pages, Lewis explores, “Joy, Fun, the Joke Proper, and Flippancy” with an economy and incisiveness that should provoke jealousy in any writer except that admiration overwhelms envy. Lewis’ Screwtape associates Joy with Music and says “something like it occurs in Heaven – a meaningless acceleration in the rhythm of celestial experience” which he as a demon detests. Joy and laughter are “a direct insult to the realism, dignity, and austerity of Hell” according to Screwtape. Toward the end of the book, World War II, which has always been hovering at the edges of The Screwtape Letters, comes to the forefront as the German bombing campaign of Britain begins and the unnamed young man who is the focus of Wormwood’s intentions joins the war effort. Here it was impossible for me to think Lewis’ wasn’t speaking from his own experiences fighting in the First World War, and he does a masterful job making us feel the quality of that time in England. I have looked up this girl’s dossier and am horrified at what I find. Not only a Christian but such a Christian – a vile, sneaking, simpering, demure, monosyllabic, mouse-like, watery, insignificant, virginal, bread-and-butter miss. The little brute. She makes me vomit. She stinks and scalds through the very pages of the dossier. It drives me mad, the way the world has worsened. We’d have had her to the arena in the old days. That’s what her sort is made for. Not that she’d do much good there, either. A two-faced little cheat (I know the sort) who looks as if she’d faint at the sight of blood and then dies with a smile. A cheat every way. Looks as if butter wouldn’t melt in her mouth and yet has a satirical wit. The sort of creature who’d find ME funny!